Gonzalez Unveils Plan to Tax Colleges, Universities in Mass. Democratic candidate for governor Jay Gonzalez has unveiled a new plan to get more money for Massachusetts' schools and transportation systems. 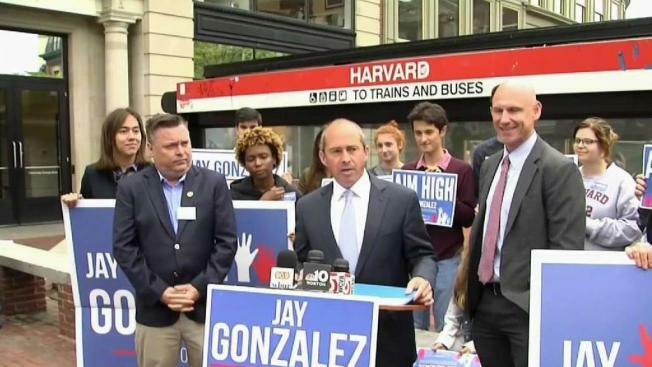 Democratic candidate for governor Jay Gonzalez said Massachusetts could raise $1 billion a year for education and transportation by taxing the endowments of the state's wealthiest colleges and universities like Harvard University and MIT. Gonzalez said the plan he unveiled Wednesday would bring in revenue needed to help make child care and preschool affordable for all families and fully fund public schools while also improving the state's roads, bridges and public transportation systems. The plan would pay for the improvements by imposing a 1.6 percent tax on the endowments of private, nonprofit colleges and universities with endowment funds exceeding $1 billion. Gonzalez said there are nine colleges and universities that meet the criteria including: Harvard University, the Massachusetts Institute of Technology, Williams, Boston College, Amherst, Wellesley, Smith, Tufts University, and Boston University. Gonzalez, who announced his plan at a press conference just outside Harvard's campus, said its time for well-heeled universities to step up. "I think it's fair to ask the wealthiest among us — including major institutions that have accumulated enormous wealth in part thanks to their exemption from taxation — to contribute to our greater community," Gonzalez said. Under the proposal, Harvard would pay more than $560 million annually, Gonzalez said. MIT would pay more than $200 million. He said each of the nine endowment funds has seen an average annual return of between 4.8 percent and 8.4 percent over the past 15 years. Gonzalez is hoping to unseat Republican Gov. Charlie Baker in the November election. Baker is seeking a second, two-year term. Baker said Wednesday that he was opposed to a similar plan floated by President Donald Trump earlier this year that would have also taxed college and university endowments. Baker said he opposed the plan because the vast majority of the money used in endowments supports scholarships and financial aid, much of it directed at low-income and middle-income students. "I thought it was a bad idea then, and I still think it's a bad idea," Baker said. Universities and colleges have also pushed back on similar proposals to tax their endowments when they have been floated in the past. The universities argue that institutions of higher learning are a key engine to the economy in Massachusetts, helping produce the brain power needed to fuels things like the state's current boom in the high tech and life sciences fields. The search for new sources of revenue comes after the state's highest court rejected as unconstitutional a proposed "millionaire tax" ballot question backed by Gonzalez and other Democrats that called for a surtax on Massachusetts wealthiest earners. The proposed constitutional amendment would have imposed a surtax of 4 percent on any portion of an individual's annual income that exceeds $1 million, which supporters said would generate some $2 billion annually in additional revenue for education and transportation.